We can classify it into two groups: End devices and gateways. End devices or nodes are often lot smaller in capability as compared to gateways. As more and more processing is pushed to the network edges (to gateways and nodes), traditional devices that used to run without an OS are embracing new OS implementations customized for IoT. While IoT OS are an evolution of embedded OS, IoT brings its own additional set of constraints that need to be addressed. A mix of open source and closed source IoT OS available in the market. Since IoT is varied in terms of applications, hardware and connectivity. 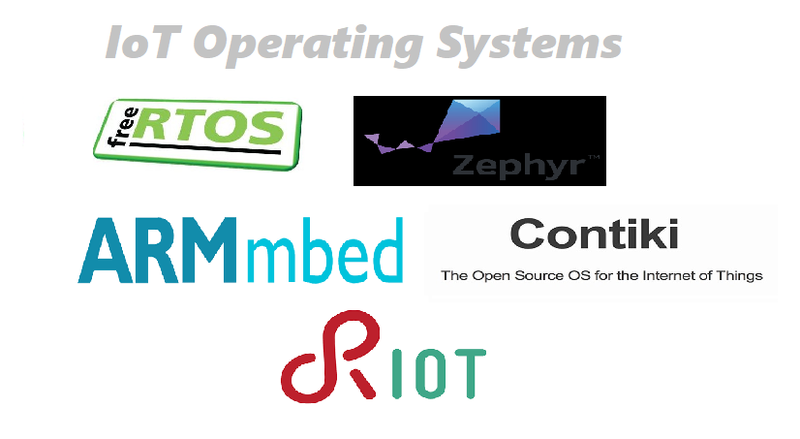 Some Embedded/IoT Operating Systems are available here. TinyOS is an embedded, component-based operating system and platform for low-power wireless devices, such as those used in wireless sensor networks (WSNs), smartdust, ubiquitous computing, personal area networks, building automation, and smart meters. It is written in the programming language nesC, as a set of cooperating tasks and processes. It began as a collaboration between the University of California, Berkeley, Intel Research, and Crossbow Technology, was released as free and open-source software under a BSD license, and has since grown into an international consortium, the TinyOS Alliance. Arm Mbed OS is a free, open-source embedded operating system designed specifically for the “things” in the Internet of Things. It includes all the features you need to develop a connected product based on an Arm Cortex-M microcontroller, including security, connectivity, an RTOS, and drivers for sensors and I/O devices. Nucleus RTOS is a real-time operating system (RTOS) offered by the Embedded Software Division of Mentor Graphics, a Siemens Business, supporting 32 and 64 bit embedded platforms. The Nucleus RTOS is designed for real-time embedded systems for use in medical, industrial, consumer, aerospace, and IoT applications.